With so many chili recipes out there, it’s hard to find the perfect one. So, I combined three of my favorites into this easy & delicious meal made right in the slow cooker. 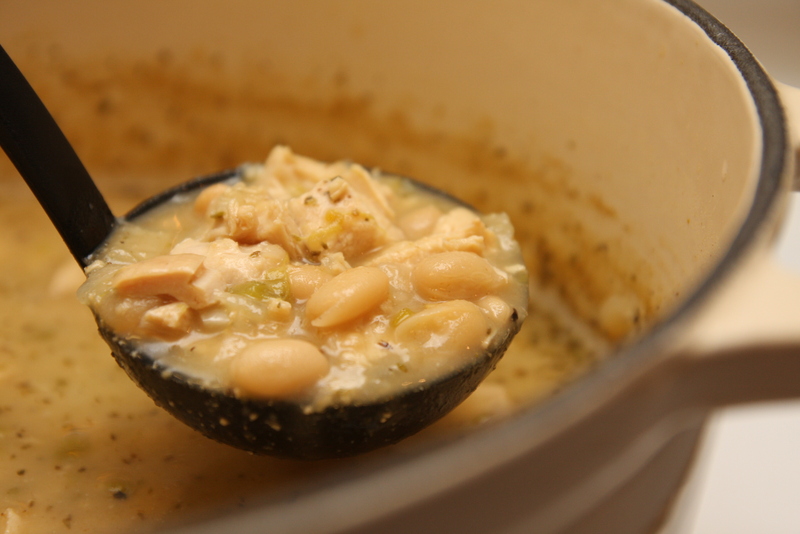 Place cubed chicken in bottom of slow cooker and top with beans, corn, and onion. Mix garlic, taco seasoning, chilis, soup, broth, and lime juice in a medium bowl and pour over the chicken mixture. Cover Crockpot and cook on low for 8-10 hours. Prior to serving, shred any remaining chicken cubes with a fork or use a potato masher. 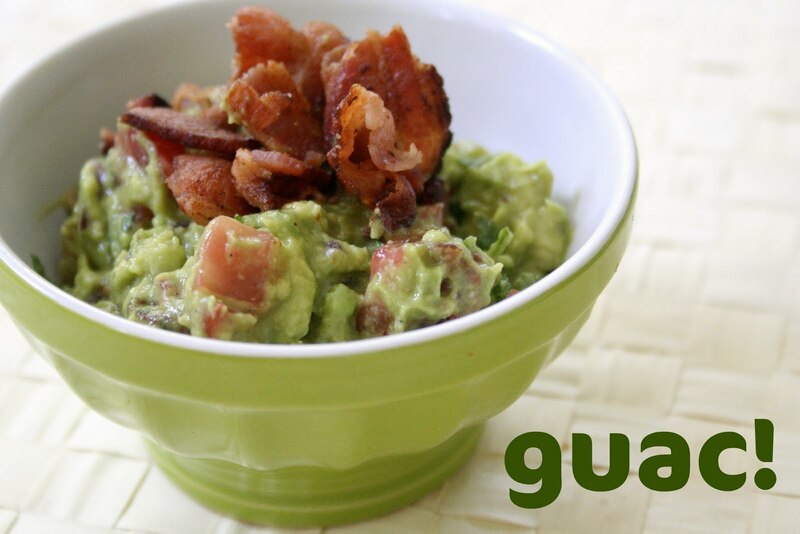 Add toppings and enjoy! 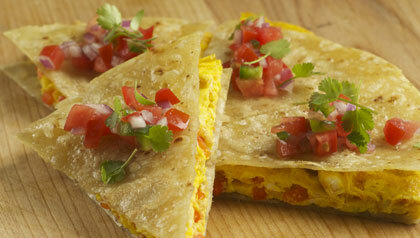 Breakfast is my favorite meal of the day – make it yours too with this delicious Tex-Mex recipe. Cook bacon, following package directions, until crisp. Set aside. 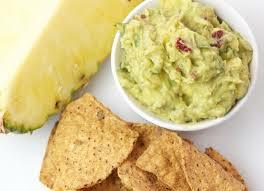 Combine salsa, sour cream, and 1/4 cup cheese in small bowl and place in refrigerator. Preheat large pan on medium-high heat. Spray pan with non-stick cooking spray and cook onions for approximately 3-4 minutes or until they begin to brown. Stir in eggs, 1/2 cup cheese, and vegetable seasoning and cook until eggs are firm. Equally divide egg mixture on 1/2 of each tortilla. Top with 1/4 cup cheese and 2 slices of bacon. Fold in half and return to pan two at a time, lightly coated in non-stick cooking spray. Cook 2-3 minutes per side or until golden brown. Take out creamy salsa mixture from refrigerator and serve with warm, gooey quesadillas. This past weekend I celebrated my wedding anniversary and on Saturday my husband and I stopped by Legal Seafood for a late afternoon drink and appetizer. 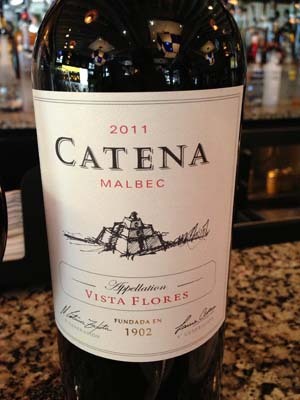 We both decided to try one of the bartender’s recommendations, the 2011 Catena Malbec, Vista Flores. It was a great decision as this wine was not too dry like a Cabernet and not too light like a Merlot. Catena Malbec is a medium to full-bodied red produced in the Mendoza region of Argentina known for their Malbecs, Cabernets, Syrahs and Tempranillos. This particular wine was a nice dark ruby color, had a slightly peppery nose and flavors of rich plum and blackberry with hints of mocha, fennel and vanilla on the finish. It was well-balanced and pairs well with many different foods. We thoroughly enjoyed it along with our hot crab dip and wonton appetizers. 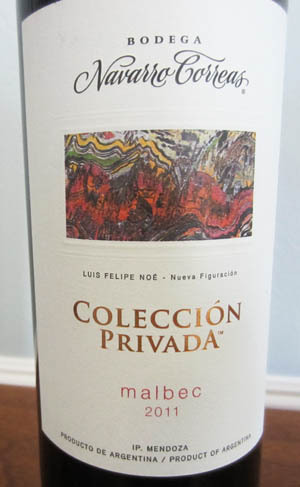 I will definitely look for this malbec next time I shop for wines and stock up with a bottle or two. Food Pairing: Malbec is a very versatile wine which can accompany lean meats, lamb, pork , spicy dishes from Mexico, India, Thailand or Italy as well as the sharper, harder cheeses. Ah, this frozen drink, similar to a piña colada, brings to mind our vacations in Key West, the soft breezes, music floating on the air and great times along Duval Street. The first Key Lime Colada we ever had was at Rick’s Tree Bar on Duval and we instantly fell in love with the refreshing taste. They wouldn’t part with their recipe but, after some experimentation, I made one that was pretty close. And it sure was fun trying! Combine all of the above ingredients in a blender. 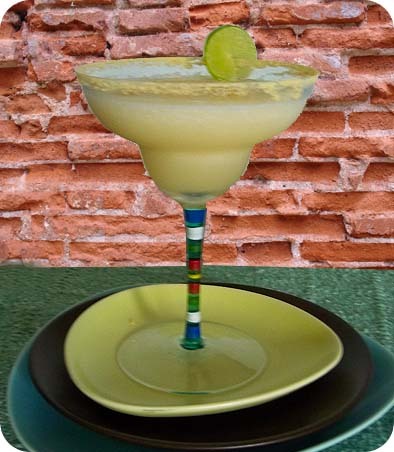 Prepare margarita or martini glasses by rubbing lime around the edge and dipping the rim in graham cracker crumbs. Pour Key Lime Colada mixture into 2 glasses and garnish with slices of lime. 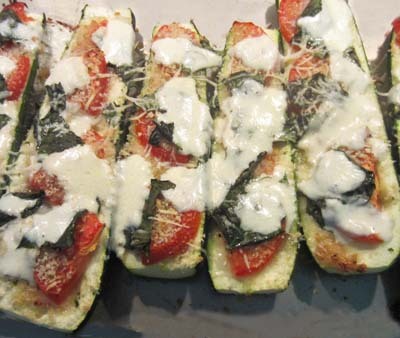 Zucchini – Whatever Floats Your Boat! I have developed a taste for zucchini lately and have been looking for new ways to fix this nutritious and delicious veggie. Did you know it was a member of the summer squash family and delivers loads of Vitamin C, Vitamin B-6 and potassium? It even delivers smaller amounts of Vitamin A, magnesium, calcium and iron and all for only 33 calories for the entire zucchini! Of course, now that I told you how low in calories this vegetable is, I am going to up the count by adding some delicious cheese but still keep it on the healthy side with the addition of tomatoes and fresh basil. 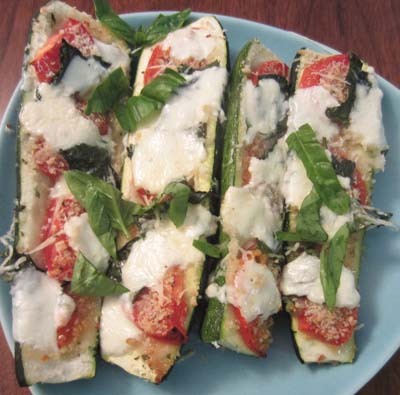 You will find it quite similar to a margherita pizza but with a lot less calories! Preheat oven to 350 degrees. Spray a cookie sheet with non-stick spray or line with aluminum foil. Slice zucchini in half lengthwise and, using a teaspoon, scoop out seeds and just a little extra so that it can hold the other ingredients. Place on prepared cookie sheet. If you need to, cut a little off the bottom of each zucchini half so that it sits flat. In a small bowl, mix 3 Tablespoons olive oil, minced garlic, salt & pepper. Brush over the top of each zucchini. Arrange the sliced tomatoes on top of the garlic spread then sprinkle with breadcrumbs. Bake in oven for 30 minutes. Remove from oven and place slices of mozzarella around tomatoes and sprinkle with a little of the chopped basil and Parmesan cheese. Drizzle remaining olive oil over the top and place under broiler until cheese has melted and browned. To serve, top with remaining basil and Parmesan cheese. Note: The amount of ingredients you use is up to you and your family’s tastes. I like to use quite a bit of garlic and fresh basil when I prepare this dish and sometimes add some red pepper flakes to the olive oil-garlic mixture for a little extra kick. Enjoy! 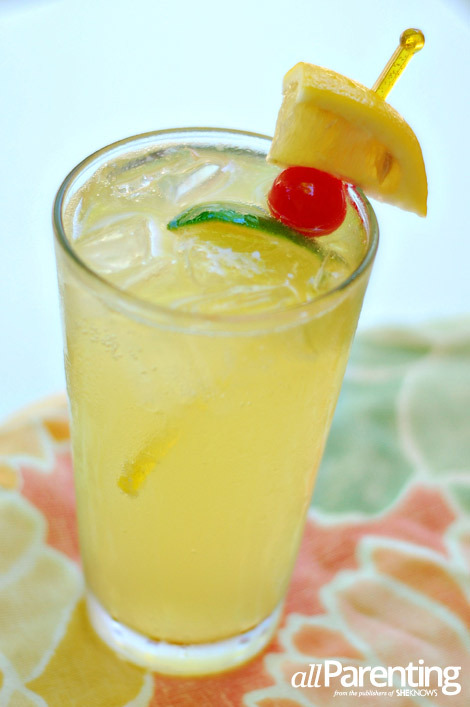 It is getting mighty hot down in here in Florida so refreshing drinks are in high demand! Here are 2 summer sips that will have you cooling down in no time. Boil sugar, thyme sprigs, and 1 cup water in small saucepan until sugar is dissolved. Remove from heat, let cool, and discard thyme sprigs. 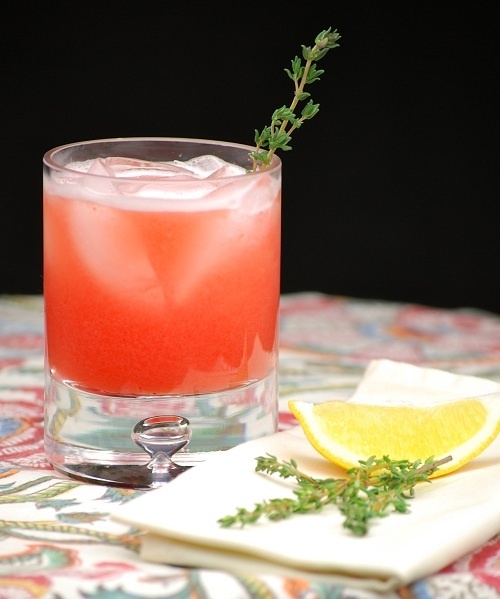 Combine thyme syrup with strawberries, lemon juice, and 5 cups water in pitcher and chill for at least 30 minutes. Serve over ice with a fresh thyme sprig and a splash of vodka. Combine pineapple juice, coconut water, and lime juice in a large pitcher. Chill for 30 minutes. Add in club soda and immediately serve over ice. Garnish with pineapple wedges and add in a splash of rum. What a surprise this wine was when I had it recently. We were having a dinner of grilled steak and vegetable shish kabobs and I wanted something that would complement the beef. This versatile wine fit the bill perfectly. This Argentinean wine, grown in the Mendoza region known for its superb Malbecs, greets you with aromas of herbs, flowers, cherries and plum and then the intense flavors of wild berries, cherries, plums and figs with hints of chocolate, vanilla and smoke explode on your palate. There is a spicy intensity to this wine, along with a slight oakiness, that carries its flavors right through to the lingering finish. Not only will you find this is a better than average wine but also a bargain at under $10. Stock up on this one if you enjoy an aromatic and spicy Malbec. 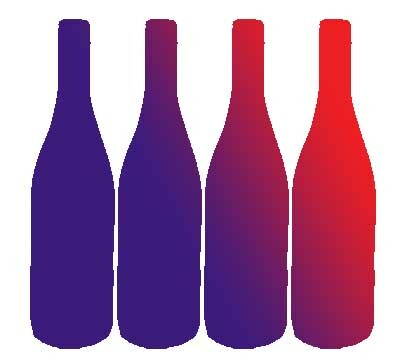 Food Pairing: Malbec is one of those wines that go with just about anything. Whether it is a filet mignon, spicy Mexican, Thai or Italian meal, lamb, game, semi-hard cheeses or even barbecue, this wine won’t disappoint. There are several ways you can make your home-baked goods more healthy and still make those favorite family recipes taste delicious. 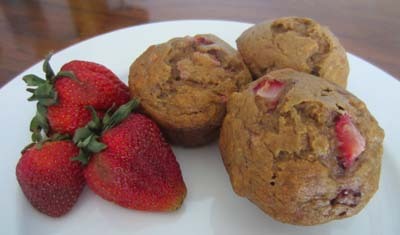 Here is just one example of substituting ingredients in one of my favorite recipes – Banana Strawberry muffins. Preheat oven to 375 degrees. Spray a 12-cup muffin pan with a nonstick spray. Set aside. In a large bowl, mash bananas then mix in brown sugar, unsweetened applesauce, eggs and vanilla. In a smaller bowl, combine flour, baking soda, cinnamon and salt and mix well. Add to mashed banana mixture and stir to combine. Stir in strawberries until incorporated. Divide batter evenly between 12 muffin cups. Bake for 20 minutes or until toothpick in center comes out clean. Place pan on wire rack and let muffins rest for 5 minutes. Remove to wire rack to cool completely. Raw brown sugar vs white sugar: Since raw brown sugar goes through less refining than white sugar it has slightly fewer calories contains more natural minerals and an overall higher nutritional value. Unsweetened applesauce vs vegetable oil: Using unsweetened applesauce in place of vegetable oil reduces the fat content of the muffins while still helping to retain their moistness. 1/2 cup of vegetable oil has 1920 calories, all from fat, while 1/2 cup of the applesauce has 50 calories with zero from fat. 100% whole wheat flour vs white all-purpose flour: Whole wheat flour retains more of the natural nutritional grains since it requires less processing than your everyday bleached white flour. These natural grains contain more folate, riboflavin and vitamins B1, B3 & B5 than all-purpose flour. Additionally, whole wheat flour contains more dietary fiber, 1/2 cup has 6.4 grams vs 1.3 grams, which is known to help prevent constipation and lower cholesterol. Note that some enriched all-purpose flours contain similar amounts of the same nutrients contained in whole wheat flours but without the additional fiber. 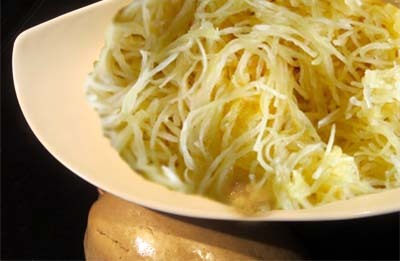 A delicious addition to any meal, spaghetti squash can be fixed many different ways but it is the fact that this vegetable can look like spaghetti that creates the many variations. In this recipe I am using the squash in place of pasta, similar to an Italian macaroni and cheese, and dressing it up a little with some fresh garlic. I served it as a side for grilled fish but it could just as easily be a side dish for meat of any kind. Preheat oven to 450 degrees. Prepare a cookie sheet by lining with aluminum foil. Cut squash in half and scoop out seeds. Season with 1 Tablespoons olive oil, salt & fresh ground black pepper. Place, cut side down, on prepared cookie sheet and cook for 25-35 minutes depending on size of squash. Remove from oven when tender and wait for it to cool slightly. Taking a fork, shred the squash into what looks like spaghetti noodles. Place in a large bowl. Add 2 Tablespoons olive oil, roasted garlic, Parmesan cheese and additional salt and quite a bit of freshly ground pepper. Stir and serve immediately. Note: In place of roasted garlic you can saute 1 teaspoon of minced garlic in a skillet for 1-2 minutes or until browned.